Note: If you’re looking for my older guides to Twine 2.0, they now live here. This guide explains what a passage is in Twine and how to create links between them. These instructions apply to any story format in Twine, including the default Twine 2.1 format, Harlowe, and my preferred story format, SugarCube 2. 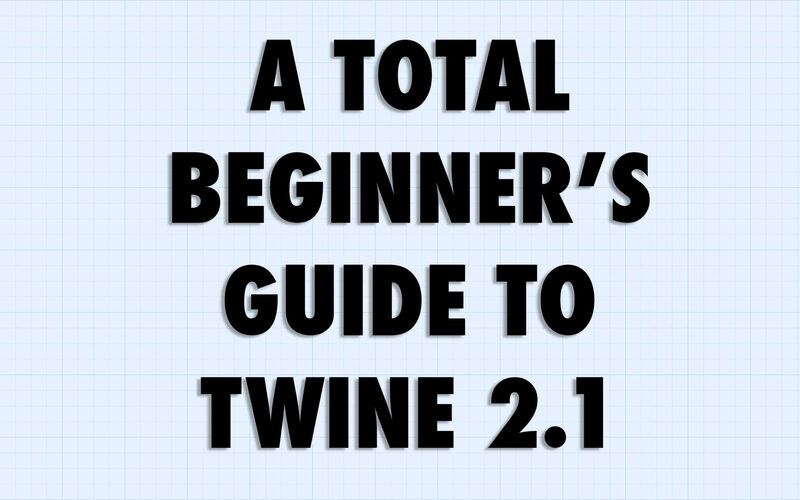 This guide explains how to use CSS to change the appearance of your Twine 2.1 game. All these instructions are based on the SugarCube 2 story format. Before beginning, make sure that your Twine game is set up for the SugarCube format. To do so, click on the name of your story in its main “story map” view. Select “Change Story Format” and check the box next to “SugarCube 2.x” This guide was designed for my students, and assumes some familiarity with HTML and CSS. Okay, so that changes the default settings for your whole game. But what if you want only a particular passage to have its own background color, or its own special font? s for you. But if you’re not happy with the way Twine is inserting HTML in your game, you can enter your own HTML code right into a passage. This guide explains how to add images and music to your Twine 2.1 game, and also how to design a folder structure and use relative links. Before beginning, make sure that your Twine 2.1 game is set up for the SugarCube 2 format. To do so, click on the name of your story in its main “story map” view. Select “Change Story Format” and check the box next to “SugarCube 2.x.” Note: this guide assumes some familiarity with HTML and CSS. The way to get total creative control over your game is to design it in a folder structure you’ve created yourself. Let’s say, for example, that I make a folder called “Hallway Game” somewhere on my computer’s hard drive. This is going to be where my game and all of its media assets (images, audio tracks, etc.) are going to live. In the main hallwaygame folder, I’m going to put the game itself, which I’ll plan on calling “Hallway Game.html” (remember, Twine games publish as HTML files). Now within the “Hallway Game” folder, I’m going to make a subfolder called images, which is where I’ll put all the images for my game. Let’s say I’ve made my own original image of a hallway with two doors at the end. I’ll save that image as hallway.jpg and put it in the images subfolder I’ve just created. If you press the Play button in Twine, you’ll see — uh oh! — that the image doesn’t appear. That’s because when you press Play in Twine, you’re just seeing a kind of preview of your game. Where this “preview” exists is a tricky question. It’s sort of in a netherworld. It’s not published on the web for all to see; and while it’s somewhere on your computer, it’s not in a place that you can usefully access. So let’s bring the Twine game out of this netherworld and put it somewhere concrete. We do this by clicking on the story name from the main “story map” view and selecting “Publish to File.” Excellent: now let’s save our game as “Hallway Game.html” in the folder we created for it. Now, let’s leave Twine for a moment. Let’s go to the folder where we saved “Hallway Game.html” and double click on it. It will open up in a web browser — and if you’ve entered your img tag correctly, your image will display. Now collect a bunch more images for your game, and save them all in the images subfolder. Wherever you want them to appear in your game, use img tags with relative paths pointing to images/. Now your Twine game is all in one place — all contained within the hallwaygame folder. You could now upload this folder onto a webserver and it would display just as well as it does on your own computer. (Since relative paths are, well, relative, they don’t care whether they’re on your computer or on the web — all they care about is how to get from one place to another, and whether you’re on the web or on your own computer, the way of getting from “Hallway Game.html” to “hallway.jpg” is the same: look into the subfolder images, and it will be there. In theory, there is nothing special about adding music. You could just use the standard HTML tags for adding music. In practice, though, SugarCube 2 has a much simpler way to add music — a set of so-called “macros” that make working with music a breeze. SugarCube’s audio macros work in two steps. First, you need to load the songs and give them unique names. Next, when you’re ready to actually play the song, or pause the song, or fade the song out, you insert a different macro in the particular passage of your story where you want this to happen. To load the songs, we’re going to create a new passage called StoryInit. This is a special passage that SugarCube treats in a special way: it executes all the commands in this passage before showing the player the first passage of the game. StoryInit isn’t linked to any other passages, because it isn’t part of the story. It’s just a place for doing mundane business related to the story. Here, we’ll use it to load songs. The first line creates an “audio asset” named main song (though you can call it whatever you want) out of an audio file called dauphin.mp3 that is located in the music subfolder relative to “Hallway Game.html”. The second line creates a second audio asset called happysong out of a file called henry.mp3 that we’ve put in this same folder. If you hit “Play” within Twine, you’ll notice that this isn’t working yet. Well, of course it isn’t working! We need to bring our Twine game out of the netherworld and use the “Publish to File” feature to save it as a concrete HTML file in the “Hallway Game” folder — its true home, where all its media assets are located! — before it will start working. If you do that, it you’ll hear your song. One you again publish your game to the “Hallway Game” folder, you’ll find that you now have a very advanced Twine game, complete with a soundtrack that adapts to the action! Next, you will want to check out the full list of SugarCube 2.x audio commands (it can do a lot more than just play and stop!). Twine begins by evaluating the first line of the if statement; if that’s not true, it looks at the first elseif line, then looks at the rest of the elseif lines (if there are any more), and then stops working when it reaches <</if>>, which means that the if statement is over. In addition to if and elseif, you can also write else, which just means “If none of the if or elseif conditions are met, then do this.) Also, note that if you’re working with numbers, you can use conditional operators like gt (“greater than”) and lt (“less than”) instead of just is. These are just a few examples to get you started. If you get excited by this, you will want to check out this full list of SugarCube 2.x macros. That’s it! Now go forth and make awesome Twine games!! !